With our expertise in incontinence care. We will help you find the right product for your needs. We offer a full line of diapers, pull ons, liner and bed pads, discreetly shipped right in front of your door. 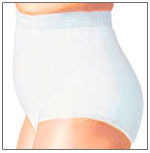 Our pull-on disposable underwears/briefs are very comfortable and convenient to use for any types of incontinence. The elastic portion contributes a good fit and a less chance of leaking. We offer washable and disposable bed pads that protect matresses and chairs from different levels of incontinence. Our liner is designed for men and women to protect from light uncontrolled incontinence. Give our Customer Care Representatives a call! Just dial our hotline 800-777-6647 and we'll be more than happy and pleased to verify your Medicaid and other insurance eligibility. We offer an easy automatic delivery plan to ensure continuous supply of your incontinence products. Our CCRs can assist you with your requests to change products and order, delivery information and/or cancelation anytime without a hassle.